In ancient Rome, the Colosseum was a circus. Completed in 80AD, it hosted entertainment for the masses, and what entertainment it was! Up to 50,000 spectators would watch the ultimate in populist entertainment including recreations of famous Roman battles, animal hunts and fierce gladiatorial battles to the death. It was completed largely under the patronage of the familial rulers of the Flavian dynasty, Vespasian and his son, Titus. Suetonius, who displayed an almost-contemporary regard for gossip and scandal, considered Titus (no relation to Shakespeare’s gore-soaked opportunist) a worthy emperor and thus the Colosseum remains one of his greatest legacies. In modern times, the Colosseum is still a circus although a little worse for the wear and tear of the ages. Togas have been replaced by logo t-shirts and baggy cargo shorts, leather sandals by the gleaming white runners of the elderly American tourists who look as if the furthest they’ve ever jogged is to the nearest all-you-can-eat buffet. They cram inside its massive brooding walls, gazing out on the broken arena and possibly reflecting on Russell Crowe in Gladiator or any number of Steve Reeves sword-and-sandal epics. Oiled pecs gleaming in the sun, the glinting fury of swords cleaving human flesh, the deafening roar of a crowd maddened by blood lust. The images come readily, the atmosphere leaching from the weathered stone blocks. Any thoughts of Anita Ekberg wading through the Trevi Fountain a couple of blocks away or Audrey Hepburn, regally serene astride a Vespa with Gregory Peck, seem like another Rome altogether. The Colosseum is blood, sweat and tears for the ages. 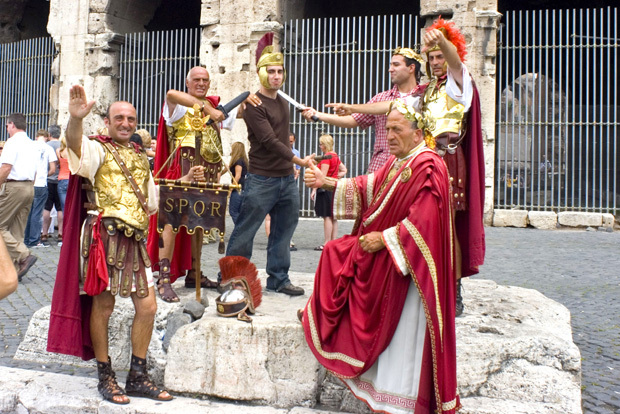 Outside, the snaking lines of tourists are tempted by hunky Romans dressed up as gladiators. For a few Euros, nothing less, they’ll be photographed flirting with the ladies and menacing the men with their plastic swords. Their scowls have been carefully crafted over years of mirror-gazing to maximum effect. Warren Beatty in The Roman Spring of Mrs Stone had nothing on these guys. Yet, amongst the many locals eager to share a Kodak moment for a fistful of foreign currency, the most popular were those I came to regard as the Four Stooges. Three were attired in the leather skirts and gold breastplates of Roman soldiers, the fourth as an emperor resplendent down to his crimson robes and gleaming laurel wreath. All were gregarious and entertaining, jokes at the ready, flashing smiles and deadly poses for a never-ending line of delighted tourists. The startlingly handsome gladiators, with cheekbones as sharp as their plastic swords were blunt, kicked the dirt in rejection. There was no competing with the Four Stooges and they knew it. They were the vanquished of the modern-day Colosseum, their humiliation as great as any suffered within its walls. I like this best so far. It is a mint.